setting is easy. Just slide the shroud to the desired setting. If you are 4' 8" - 6' 6" the Lynx should work fine. 20" X 11.5" X 3.5"
Comes fully assembled and is made out of lightweight aluminum. The P3™ offers you a compact, portable solution for stretching, relaxing and decompressing your body. With your ankles secure in the contoured foot supports, applying gentle pressure to the leverage handles results in a gentle stretch. The moderate self administered traction achieved when using the Lynx™ helps to realign the spine, increase flexibility in the joints, promote relaxation and improve posture through better alignment. Decompressing the discs helps them to re-hydrate for better shock absorption and reduce back pain. 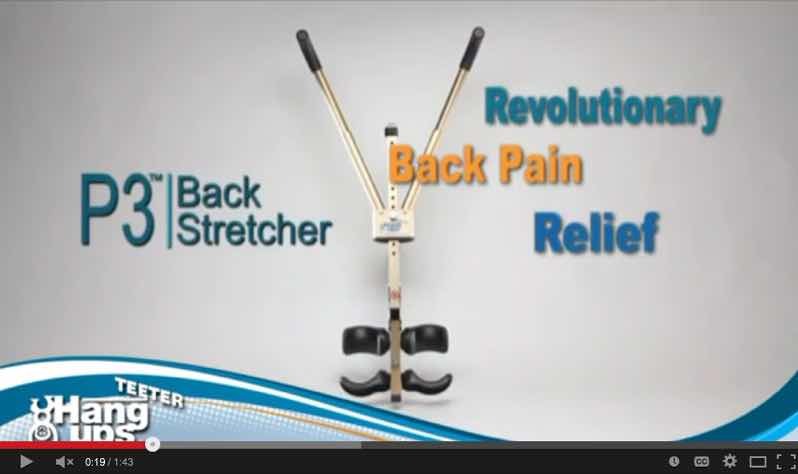 How does the P3 Portable Back Stretcher work? The Lynx works by using the same muscles that a gymnast use on the parallell bars. 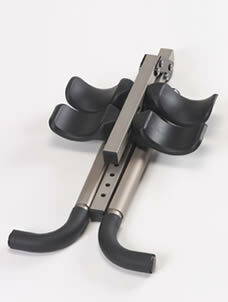 The clamps fit around the top and back of your feet. You then push with your feet away from your your body. This strteches the body between your feet and your shoulders. The main stretch is felt in the lumbar area of the spine. Please read below: Should I get an Inversion Table or the P3™? 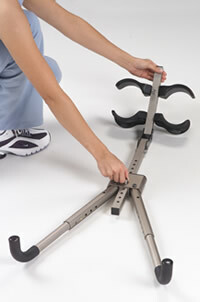 Should I get an Inversion Table or the P3™ Portible Back Stretcher? The P3 previously known as the Lynx™ Portible Back Stretcher is an excellent device for helping your spine stretch especially while on the road if you do not have an inversion table available. However, an inversion table is going to give your spine a much more effective stretch from the lowest lumbar area to the highest cervical vertebrae. Also there are a plethora of other benefits achieved from using an inversion table including circulatory and lymph stimulation, stress reduction, oxygenation to the brain etc. etc. that cannot be achieved by using the P3 - Lynx™. Along with INVERSION THERAPY we encourage people to be sure they have bilateral symmetry in the muscle strength that holds the pelvis & back in alignment. PELVIC TILT is often a concomitant condition along with compressed discs and pinched nerves. For example after some trauma such as an auto accident the body goes into a protective mode and certain muscles may tense up. The pelvis may tilt left to right or front to back or both. This tilt affects the entire alignment of the spine. Often times one leg seems shorter than the other due to this problem. This alignment affects how the vertebra may impinge on the nerves. Inversion can usually increase the intervertebral space and relieve the direct pressure on the nerve. But in order to get a more complete correction the muscles that align the pelvis must be equally balanced and strong on both sides. There are many exercises that can assist in this effort.